I am back after a long absence. Feeling more like my old self again. I am now taking a yoga class which is helping me so much. Spring has sprung and tulips are coming up . Today temps will be in the 80’s!!!!!! 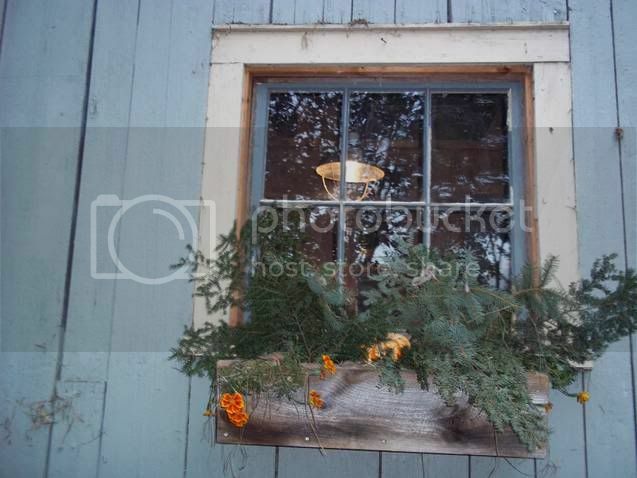 The Farmers market starts in Greenfield the first week of May so I am busy getting ready for that.. 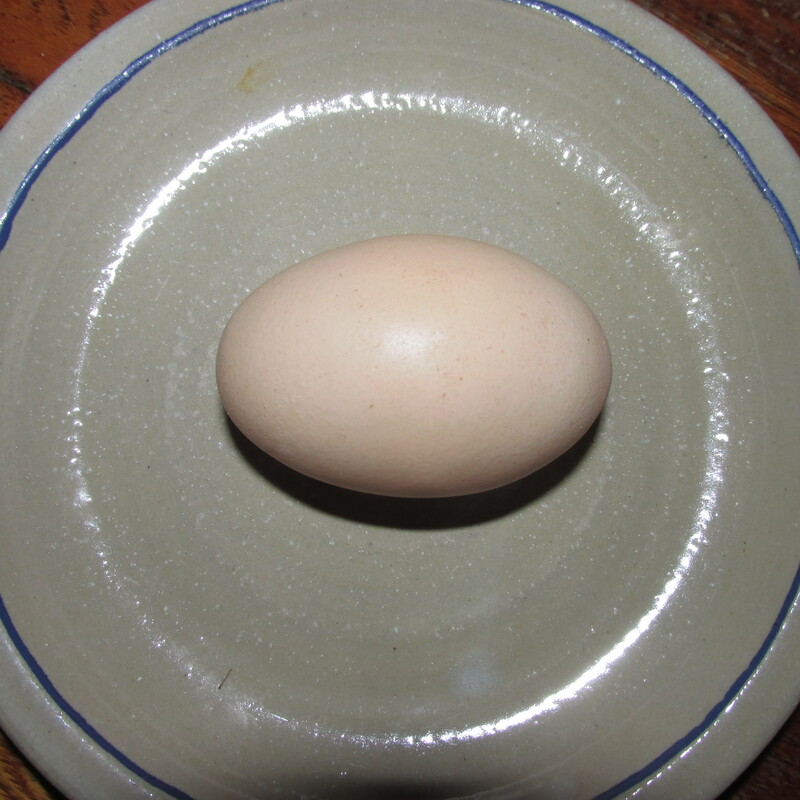 Egg production this winter has been good, but recently has slacked off. The new girl Molly should still be laying but no eggs were found. 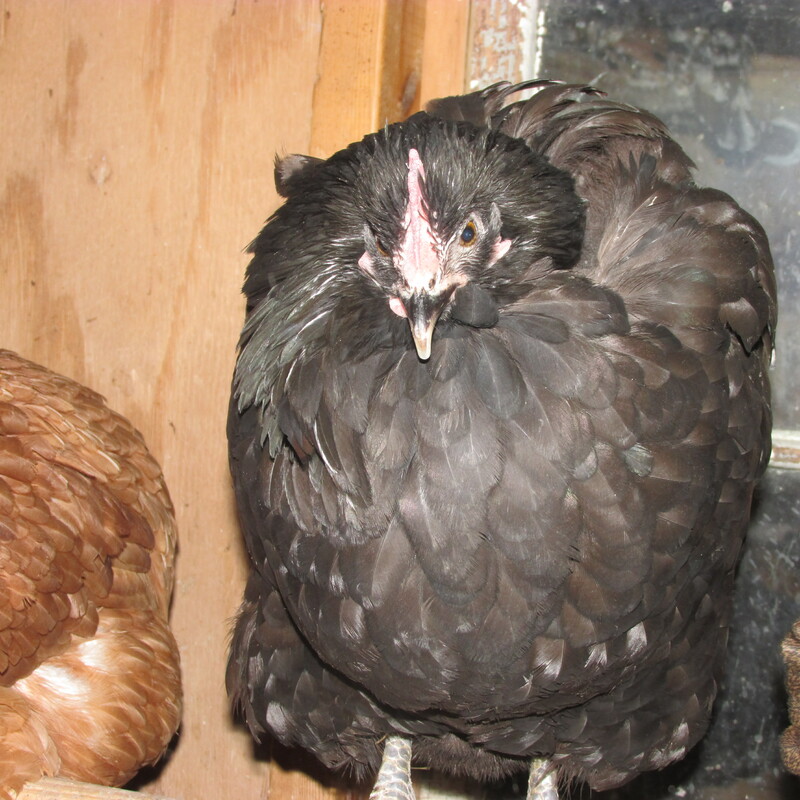 Morticia the black bantam slept high up on a shelf all winter long. So yesterday while cleaning the coop I decided to check the space and give it a clean and lo and behold I found all these eggs! I will be check this spot every day now. The sheep have been shorn and look good. My shearer Steve is retiring so I have gotten a new shearer Aaron Loux for next year. We are both on The Massachusetts Sheep Breeders Board. It’s pea planting time here on the farm. I had them soaking for 24 hours and now they are going in the ground. I plant to put another packet in soon. The hot peppers and basil are doing well and I plan to repot them soon. My regular supplier of veggie starts is taking a year off and I will miss all the heirloom starts she had. Cool nights and warm days , just my kind of weather. Cleaning up brush and cutting up fallen branches has kept me busy this last week. I see buds on some of the early tulips and others are peeking out of the ground. The spring birds are back and I love hearing their cheerful songs. A person in the neighborhood is trapping and releasing all the skunks because they are digging up his yard. I am sure he has gotten Cornelius as I have not seen him. Our neighborhood needs skunks to keep the rodent population down. i am ever hopeful that Cornelius will find his way back. Maude has had a few setbacks and is on antibiotics again. Shearing day took a lot out of her and now I am giving her added minerals and sheep drench. My Shearer Steve Marcotte did a wonderful job with her. 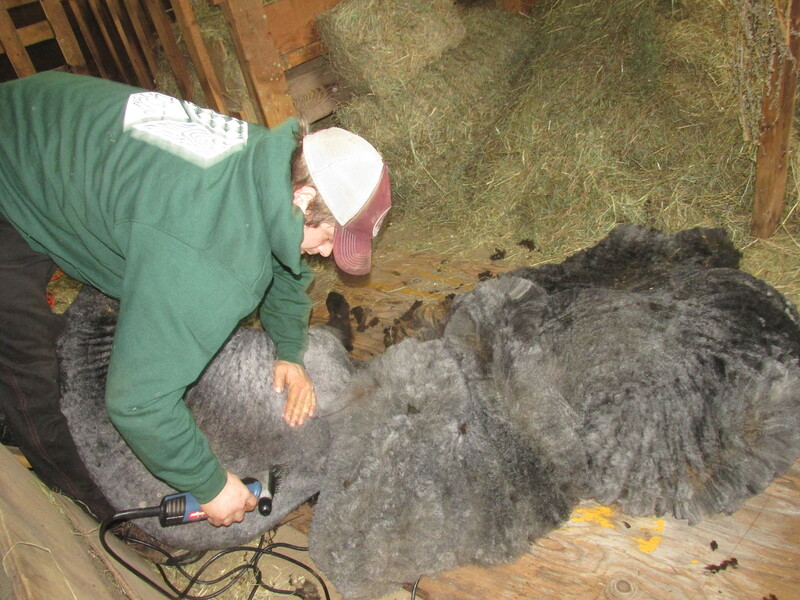 Shearing her in her pen so she wouldn’t have added stress. It will take her a while to recover from this. How do you like her poodle cut? 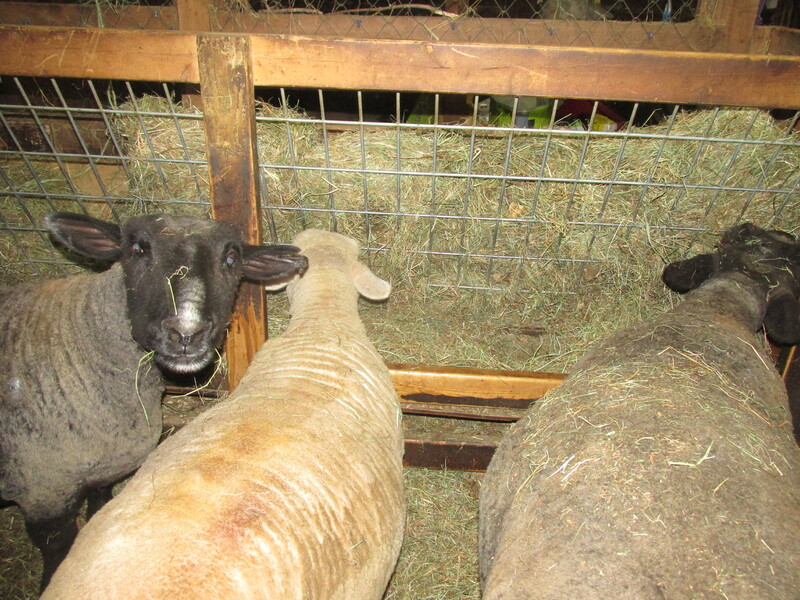 Lauren and I had to separate her from the rest of the flock when we saw the sheep doing their spring ritual ramming each other.. Of course this happened at 9 pm!! The rest of the sheep did well with shearing and look good. They are now not receiving grain much to their chagrin. Steve has been my shearer for at least 15 years. 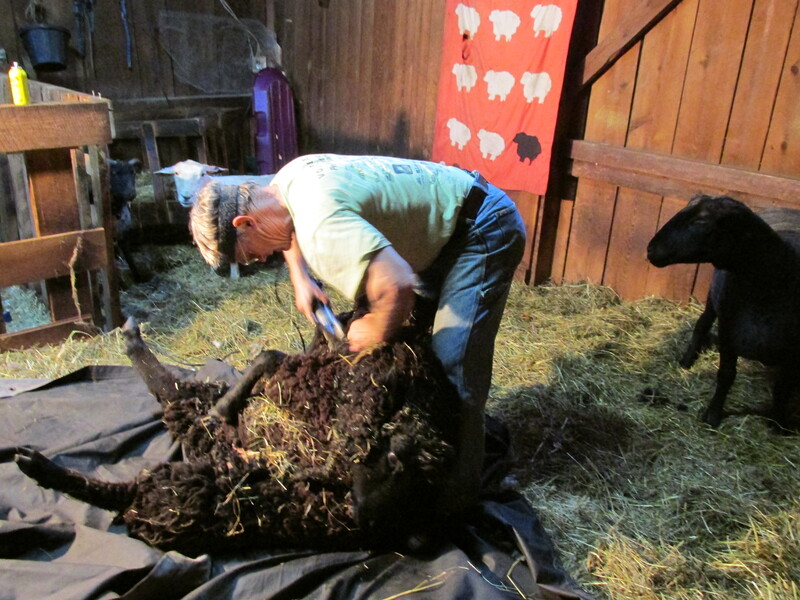 He raises sheep himself and has wonderful fleeces. I am lucky to have found him after going through shearers who didn’t show up (really famous one) and others that were too busy even though you were on their schedule. Steve always comes and does a great job I am grateful to have found him. It seems its taken me forever to get these peas in the ground. WHen I first wanted to get them in I uncovered the area and it was still frozen. I have soaked them and in they go today. It seems it’s not quite the time to start another batch of hot pepper salve but I have run out. I only could find a pound and a quarter of hot peppers and am looking for more. Another 2 pounds would be good. I found this salve to work well. It’s not the sudden action of most pain relieving salves but it does the trick of releiving my arthritis pain. add peppermint oil at the end for a pleasant order. I love the fact that I know exactly what is in it and its a lot cheaper than most brands of pain relieving salves. On Sunday coming home from the show I drove by my family homestead.. I was glad to see the house and it reminded me of the sense of security, the years of family gatherings and love that the house held.. It was a simple 5 room ranch house build for returning soldiers from World War 2. A small development of 4 and 5 room homes built on old farmland. 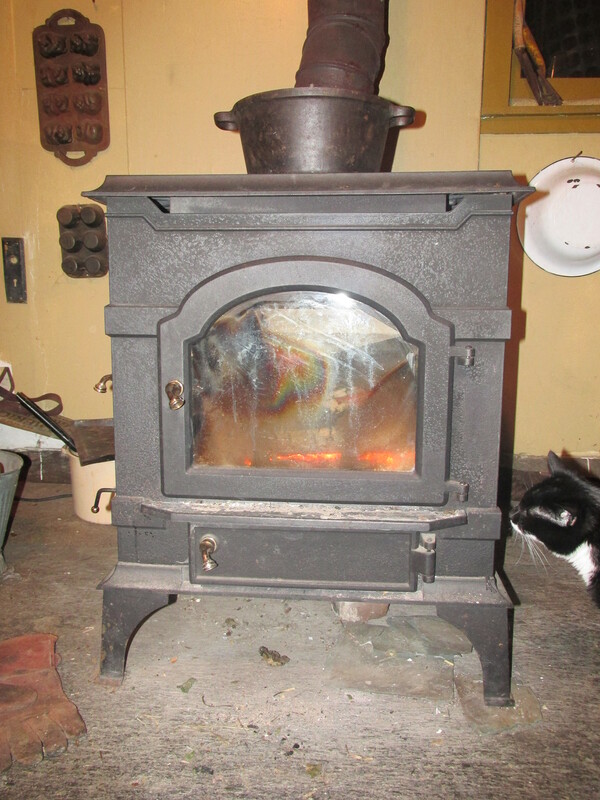 I often wish my Mother had not sold it, but she was living in Florida and felt the need to do so. Much had been done to the house by my family, a garage and sun porch added with a stone patio with a rock with a dinosaur print in it., stone walls build by my Uncle and my Grandfather, a large garden area build above the stone wall and every bit of dirt was sifted and all rocks removed by my Grandfather. 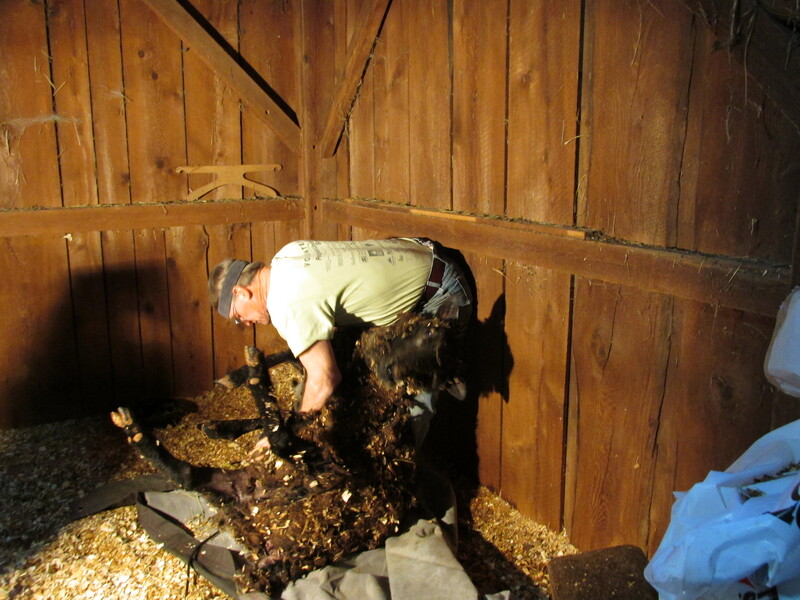 Every year manure was brought from the farm in Chesterfield and dug into the soil. I had my first garden at age 5 there. I planted a Christmas tree there from the farm, which was enjoyed many years later, lots of cucumbers which had always been my favorite vegetable and flowers. Our garden was very large and the cellar was always full of canned fruits and vegetables. Sometimes its good to visit the place where you grew up, remembering all the wonderful times there and family that is now gone, and taking the time to appreciate what I have now. I think it was Lucy who laid it. Yea!!!!!!!! Last night I took a picture of Sally, really it wasn’t all that cold in the coop but she had puffed herself up just in case. She is 12 years old, one of the first hens I got. She has minded her own business, got away from disagreements and never was on the top of the pecking order, she is a middle of the road gal. Hazel and I made the trip to Dr. Connor this afternoon. She and the staff felt he was improved, one side of his chest is cleared up but the other still has some infection in it. He will be on antibiotics for another 2 weeks. He is eating better now so I know he on the road to recovery. He will be in the house for The Crafts of Colrain, the large cat carrier sits on the kitchen table. 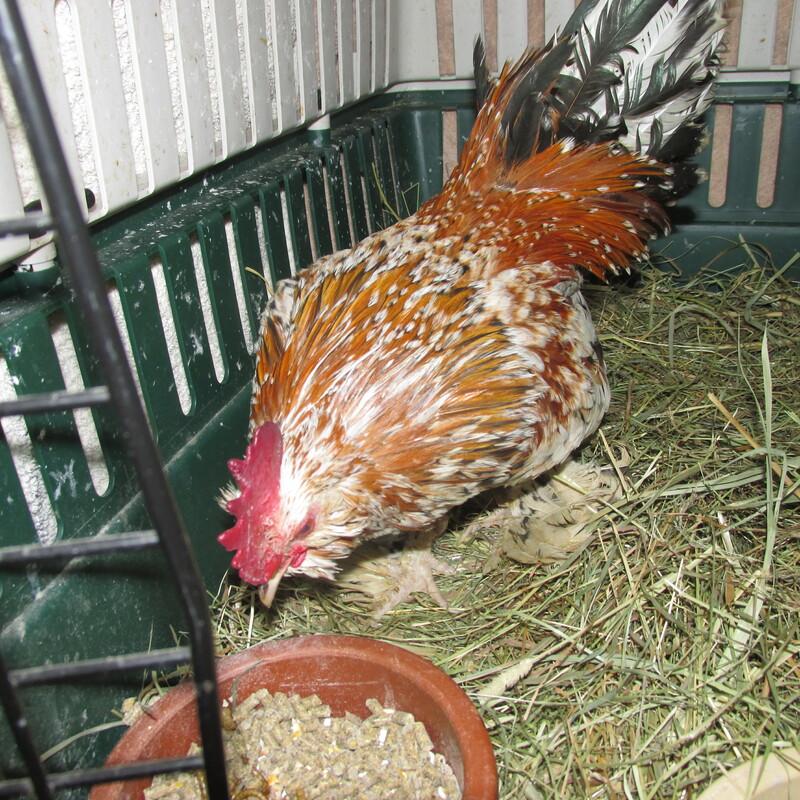 He will like all the activity and people will be surprised to see a rooster in the house. I am going to start letting him out for periods starting next week. Anyway I am glad of the good news. Mrs. Brown has been lonely and will be glad to see him. Many thanks for reading my blog and I hope you have a wonderful day. Today is a beautiful day for shearing sheep. The temps are warm they were all dry (when the shearing started) and we began promptly at 9am. Sadie was the first to be done. Her fleece won’t be the best but I will try to get enough from it to make some socks. She was very good. 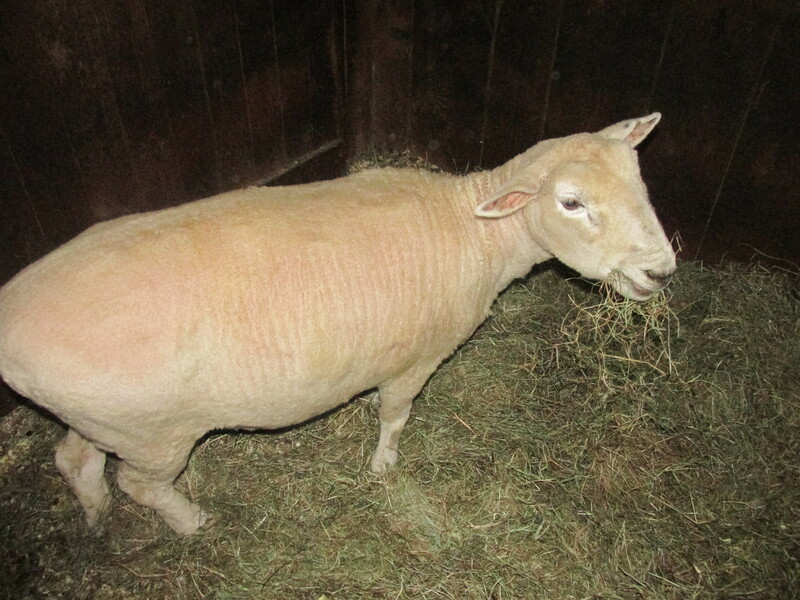 Marley was the second one to be sheared. He was hitting everyone and even me this morning, so it was time to take him down a peg or two. 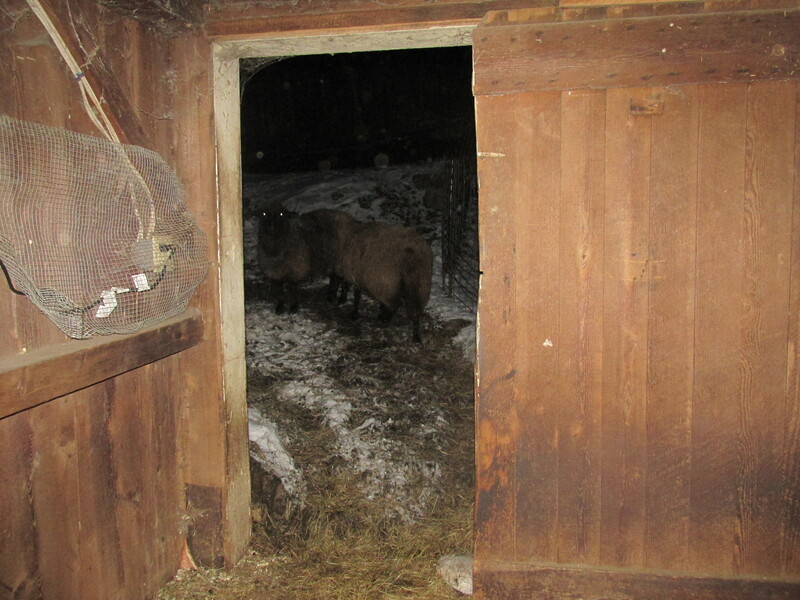 With his fleece he appears so much bigger than he is and when it’s off he hides in a corner. Everything went smoothly with him. Maude and CK were so cute. Maude is Ck’s mom and they stick together and are almost never apart. 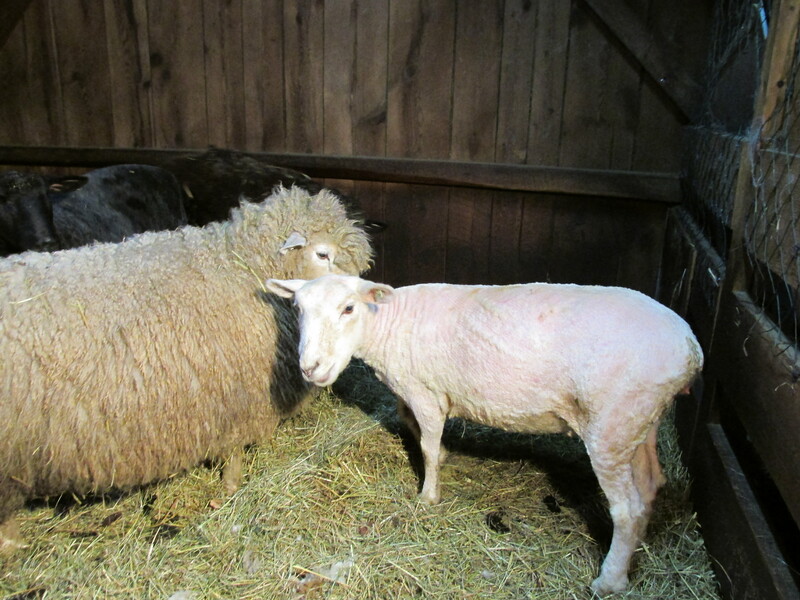 Today CK got sheared first and Maude was quite concerned, staying right next to her the whole time. In the sheep world when one sheep gets sheared the others don’t recognize him. So there was a lot of running around butting heads and the like. Eventually CK ended up jumping in the water tub, well these type of things are to be expected but it made her harder to shear and now her wool will have to be dried out. The rest of the shearing went well and we were finished by 11:30. 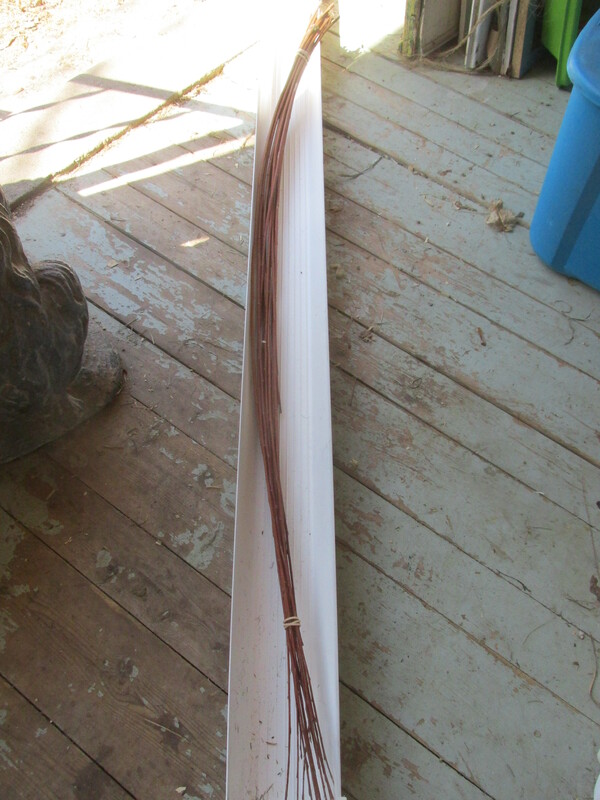 Steve gave me some tips on a new feeder which won’t waste as much hay and I am going to coat them in the fall. This next week I will be sorting through the fleeces and get them ready to send out to have yarn made. Oliver is slowly improving. He drank all the water from the tuna can this morning and is eating. His eyes are improving a little and the swelling in his mouth had reduced some. He will return for a check with Dr. Funk on Thursday.